No matter where you go on your RV journey you and your family’s shoes are going to collect dust and grit. When you settle down in a location for a stop, having a mat to cover the area outside your RV door will make sure that the dust and dirt of travel stays where it belongs: outside. Getting dirt and grime inside your RV can make the journey uncomfortable and mentally distressing; no one likes living in a dirty environment, especially when space is at a premium. RV awning mats help nip this problem in the bud before you or your kids have to spend time doing extraneous chores. It’s an unpleasant fact of the road that sometimes you will encounter crawling insects. Ants, beetles, and even centipedes are common in every state of the United States. These bugs need not ruin your trip, though. 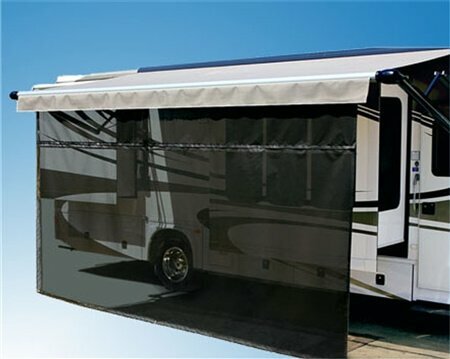 By employing ground-covering RV awning mats you can provide an additional protective layer between your outdoor accessories and the ground, as well as creating an additional hindrance for intrepid insects who hope to get into your RV. While a mat isn’t a total prevention tool for insect issues, it's the basic line of defense against unwanted natural incursions to have a floor beneath your feet. If you’re setting up your awning at a stop on your journey, you’re likely to choose a location with as attractive terrain as possible. Such sites will often include grass, and with grass comes dew and moisture. With an awning mat, you and your family can easily walk across a soft surface without worrying about getting damp shoes. Good quality mats will also allow for more sitting space, as many are as soft as interior rugs and carpets. What could be better than getting the family together to play cards outside the RV without having to worry about uncomfortable ground? This is probably the least important reason to buy a mat, but it’s still worth taking into consideration! Having an awning mat, especially a styled one, gives the appearance of your vehicle having a proper porch. An awning alone can look tacky sticking out from the side of your RV, but with a mat, some chairs, and maybe a table your RV begins to look like a proper home away from home. If you travel with your pets, having an awning mat can make their quality of life during travel much better. In addition to preventing your beloved pets from tracking mud into the RV, an awning mat makes your pet significantly more comfortable when lounging with the rest of the family. Your pets will, of course, also benefit from avoiding insects and moisture just like you will! Who wouldn’t want to let their pet enjoy the trip too? If you’re ready to pick out a quality mat, come visit us TODAY at www.rvupgrades.com! For more information about Camper Supplies and Water Softener For Rv Please visit : Rvupgradestore.